New to this forum. 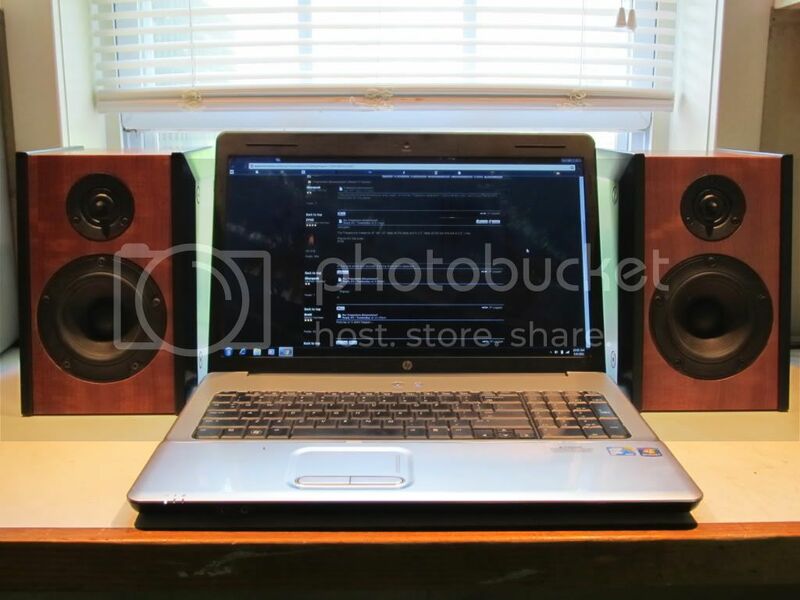 Thinking about purchasing these as they look like nice speakers, but very little info about them. Wondering if someone who owns a pair could comment or maybe I'm better off with another Decware speaker. Currently using Klipsch KLF20's which are too forward sounding for my taste. Using DIY 2A3 Loftin-White. This amp pushes 4ohms with no sweat. Also using Phillips CD80 CD player & Luminous Passive Pre amp. The MG's have plenty of neutral bass, never in your face, yet still has lots of detail. Great imaging speaker as well. You might be able to talk to Chris if you're interested. I've been an owner of MG944's for a couple of years and enjoy them. During most of this time they were interchanged with full range 8 inch Fostex based BR speakers and the Hawthorne 15 inch SI coax OB's depending on the type of music played. Initially I drove my speakers with a single Zen SE84C with CSP preamp. The Fostex was pleasing on small scale music, the SI excelled on large scale orchestral and the MG's functioned well as a good all-round speaker. Recently I added a second Zen bi-amped in series. At that point the MG's began to come to life and now I use them almost exclusively. BTW the MG's get plenty loud with one Zen but the additional power added a certain solidity and control. The bi-amping came at the expense of increased hum (aprox. 2X) however it's not audible at the listening seat. If you are going to buy them be sure to inquire about the alternate configuration from the one shown on the Decware site. It's the one I happen to own and it has a flat base rather than the scalloped bottom shown on the site. Only a few more bucks. I've bought many products from Decware and have been pleased with all of them. You will be dealing with honest and talented professionals. I, too am on the verge of ordering a pair of these. It strikes me that they would sound their best with DECWARE gear; or the gear would sound better with them than with some non DECWARE speakers. I have seen how the CSP2 takes the TABOO to a whole other level. I believe that a like synergy would result when using DECWARE gear with DECWARE speakers. During the last 4 years I have been through hell with speakers. When I changed over to tube gear I had SPICA TC 50's that my first tube amp had a hard time driving. I bought a pair of KLIPSCH RB-5 II that were a lot better, but a bit forward, trebley (is that a word) my guitar player friend said. Put them close to the wall and the bass would augment at the expense of imaging and presence. I tried a pair of TEKTON single driver speakers. While they were nice, I think the word "shouty" (how Steve described single drivers) is dead on. Then I bought a pair of Von Schweikert VR-1 monitors. These have proven very satisfactory in all respects. They sound nearly like floorstanders. The only trouble with them and the DECWARE TABOO is that I fear that the crossover is eating up an inordinate amount of power and the low sensitivity, 89db is a concern as well. Because I intend to keep the TABOO and also aspire to own a MINI TORI, either one with a CSP2 out in front, I am very tempted to order a pair of these speakers. When I spoke to Steve recently he hinted of an impending price increase. I would like to avoid that. While ordering mine, I learned that they are no longer made with a scalloped front; this has been discontinued. The speaker has a plinth and a solid front, like Miles's speakers. The picture has not been updated on the site. though. Both Steve and Bob do such excellent work! That pair turned out real pretty, the figure was unusual to bubinga, which is what is on that pair, done as a custom finish. 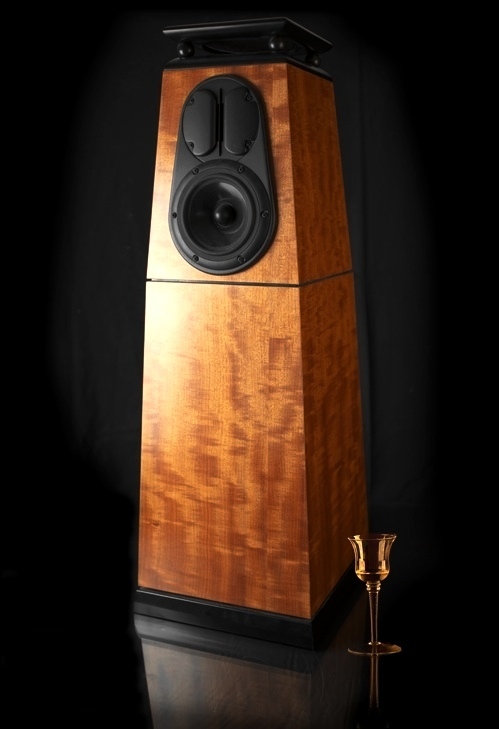 I have a pair in my room right now, they are also in bubinga but have more of a ribbon sliced vertical figure which doesn't show up as well as that pair did. My wife went into the listening room the other day, and asked are these sold? When I told her they were she sad dam, they are beautiful. That says a lot, I swear if I stuck a pair of imperials in my room she would not even notice. I ran out of shipping boxes, which I'll get Monday, until then I'm enjoying the heck out of these. I have talked to Bob many times and realized that Bob and Steve work together to this end on their designs. This takes place on both sides. I know Steve has a white paper about synergy of the entire experience. THe room, cables, cabinets, source, amp and anything else in the system need to work together to compiment each other. When I talk to Bob about the speaker design process, it almost always comes back to how the amps and speakers are voiced in a way to compliment each other. It makes sense to have a decware amp running decware speakers. It certainly doesn't mean other amps or other speakers won't work with them, but it does mean that the components have been designed with each other in mind so it's a good bet, you will be happy with the combination. I think I heard that pair of MG's at Bob's house once. Very impressive sounding and easy to get used to. Hey all. I'm new here, and have been waiting for the speakers to break in to comment. I got some MG944's about a month ago, the black pair that Steve had up for a customer who didn't take delivery. I bought them having loved the sound of the SE34I2+ and then having my enchantment with the Decware sound reenforced by Decware interconnects. So, I agreed so thoroughly with Steve's idea of good sound, and his success at arriving at it, that I figured the speakers had to be good! Really good. Especially remembering that far away look I heard in his voice when I asked him how he liked the MG944's. I loved them from the 3rd day (the first couple they were a little hard and lean sounding though I could tell they would get good) but now that they are sort of broken in (maybe 150-175 hours) they are really starting to be super sweet. Everything is mellowing with no loss of detail. The bass is tight, deep and accurate, the mids detailed and real, and the highs - out the top, but all continue to become even more musical, more integrated. The sound stage is wide and deep with virtually no sense of speakers. Before I heard accurate and beautifully detailed, now I am hearing Sweet! These speakers are really good. My only challenge has been that in my live room, the top could be a little edgy on some recordings. But then I am using a SE34 with 6N2P's, and Decware interconnects, which are very open and articulate. Also I have all power cords made from VHAudio kit stuff, silver goop on all connections, several of Alan Maher's harmonic infinity thingies in the audio chain, and I clean and treat all my CD's with Ultrabit Platnum and sand and blacken the edges.....so the system is very clean, deep, articulate and revealing. Put then, my room, with brick floors, plaster walls and a lot of glass ...if there is edge to hear, you will hear it. I have strategically placed room treatments, but the room began surprisingly good in that it is Adobe and there are many wall shifts with lots of nooks, walkthroughs and alcoves...not much regular and square about it, and the ceiling is rough wood on round log beams...so many potential sound anomalies are tempered by the irregular patterns that the waves have to deal with. In the end, the sound is beautifully alive without much room rubbish. But the edginess.....all of the drivers are softening with play, and the ribbons are getting sweet, but at this point, I like them better with the grills I made on. They take a little edge off. I am also playing with very light duty resonance damping to good effect using one white 2mm marigo dot near the outside edge of each ribbon housing. This could go away later as the speakers continue to break in, but for now, they cut whatever top edge remains, while simultaneously causing the mids to come forward ever-so-slightly. Very nice! You got a Godfather deal on those '944's, Will. I would have bought them myself had mine not already been on order for several weeks when the listing went up. I am using mine with the Mini Torii, which like the larger one, has a treble circuit. You may wish to check one of these out. Being able to adjust the treble might take the edge off of whatever room resonances you are dealing with. My MG944's are just divine in my little listening room. Yes, that was a real bargain and I am grateful for it. I am really just nitpicking about the edginess, it is so minor. You know..looking for that perfection. But the little damping I did brought them to a new level of engaging beauty very easily and we like the grilled look better in our living room anyway. And as it turns out, I am waiting for delivery on a Tori III. Good timing for me here too with the Tori on sale. I love this gear, and the sound of the SE34 is brilliant, but I would prefer just a bit more power, especially for movies where the big sound tends to carry us away (and the DVD player is quieter). But also with music, I often run the SE34 close to the distortion limit, especially with quieter recordings, so I will be happy to have the treble controls on the Tori and the extra power. Luxury! I find that the MG's sound really good at lower volumes, but I love to be fully engaged by the music, and once I give them power, I love how they help me to disappear into the music. So nice! Although I did buy my '944's when they were still priced at $849.00. Also, my Mini Torii was a prototype, No. 3, and was bought at a slight discount. Anyway all this gear is worth more than what we pay. The sound proves that. Agreed. For a sound this real, the palpable sense of the players in the room...Decware has a very audiophile friendly approach. I feel lucky to have found them. Does anybody know what the price will be after January 15th? Just an update on a previous post. Earlier, in my bright setting I found the MG944's just a little bright and had used 2mm marigo dots to very slightly chill the ribbon housing. Now, they have smoothed out even more and I took of the dots. Amazing this breakin process. They sound beautiful! Won't you keep us further apprised, Will. Will, How did you make your grills? Do you have a picture? My grills were made with what I had around plus some spray adhesive and grill cloth from Parts Express. I don't recall the adhesive's name, but it is one Parts Express recommends for grill cloth. It is a contact cement and works OK if you do not stretch the cloth TOO much. I stretched mine apparently a little too much and had to go back with bits of Gorilla super glue and temporary tape in places. I was disappointed in how the cloth was not true black, but got used to it, and it does seem to be relatively transparent. The grills soften things a tiny bit, but to me, not at all offensively, pretty evenly, and the imaging is still extremely good. It is the sound I have been working with though as I made the grills right after I got the speakers wanting a quieter look in my primary living space. I cut the grills from some 3/8 plywood, and since you can see through the cloth, I spray-painted the fronts, sides and cut out interiors black (I didn't have much paint or would have painted the backs too), glued on the cloth on the back side only, and put on cut velcro pairs at the four corners of the backs of the grills. Then I removed the paper from the other side of the velcro adhesive and carefully adhered the grills to the speaker by pressing them on in the right position. I got some grill pins, but wanted to use the velcro at first so that I could fully remove them (clean off the velcro adhesive) from the speaker if I did not like the sound of the grills. Turns out it works fine, so I have not put in the pins. I posted a couple pics. I also got some spikes...the ones that Ziggy recommended fitting the speaker plinths, and I really like them on my floor and in my room. Madisound YSC1/4-20 spikes. And finally, though I have made some bass traps and other room treatments, my room and speaker placement, my ears, my tastes, or a combination of the above cause me to prefer less bass than I was getting. I have a nearly all Decware system, a Torii MkIII, ZDAC-1, Mac Mini, ZSTAGE, Decware interconnects, Mac twisted silver interconnects, various after market power cables, and Decware speaker cables. Also a bunch of Herbie's Audio Lab stuff and vibration damping Dots from Marigo. I do love a textural clarified sound that is warm, but detailed listening to rock, but mostly acoustic music....simple jazz, bosa nova, single or a few instrument baroque, Irish traditional, minimalist choral music, but also the occasional bit of trip-hop and the like. Quite a lot of styles actually, but I have a sound that sounds like a live performance too me and this I love. Anyway, with the Torii and the MGs I was getting too much bass, probably from my room arrangement. And I had done all the room treatment I could do while still looking more-or-less like a living room, so for that last percent, on Ziggy's suggestion, I experimented with the space between the plinth and the speaker bass. For me, the magic happened at about 1/4 inch as opposed to the original 3/8 inch spacers. The bass is still strong and palpable, but detailed. I love hearing the finger hits on a string bass string and still feeling the floor vibrate, so I am getting good bass. Though this is my room and my tastes, I thought I would post this experience just in case anyone else can use it for their situation. The matching of aesthetics of a living area, and brilliant audio, for me has required a lot of learning and tuning. But I am happy. I have unbelievably real sound and it looks pretty low key. And since music is a primary component of our daily existence, for us it is important that it be in our kitchen/dining/living area. We also do not have an extra room, so there was no choice. And at this point I see no sacrifice...listening from the sweet seats is incredible with a deep, wide and articulate sound stage. The room pretty much disappears and the speakers look weird out there with no sound apparently coming from them! And for more passive listening, almost everywhere in the rooms sound awesome. Will, Thanks a lot. My speakers ship today! I have two little boys so I am a little worried about them poking their fingers into the cones if I don't cover them up. Maybe they won't even notice, but just in case. I will be able to make the covers from what you told me and the pictures, thanks. I got them on Wednesday, they are incredible. They sound so good that my wife actually sent Bob an e-mail telling him how great they sounded. (she is not into audio equipment). My kids haven't touched them but even the 1yr old dances to the music. The only bad news is I had to leave for two weeks. I put them in the closet until I get back. I think I will build a cover when I get back. It would be too tempting at some point for the little one to poke the cone because it is at the same hight as his face. He just recently started pulling albums off the shelf. But the sound was incredible. I have a Cayin A50T, Music Hall MMF 5.1 TT, Rolls VP29 Phono, and for digital, PS3 through a Musical Fidelity V-DAC. I was using Usher S520's before which had a great sound but wow, the bass on the MG944 is unbelievable. Through the V-Dac I heard some tones that reached so low I actually laughed out loud I was so happy. The louder you go the deeper you get into the sound. There isn't a spot on the volume knob where it breaks down. It seems to do everything well, instruments sound like they are in the room on Miles Davis, Kind Of Blue on vinyl. The surprise bass I heard was on the CD Brothers from The Black Keys. It isn't boomy car bass but just a super deep, tight tone. The build quality is top notch. Speakers will never be the weak link in my audio chain. Finch,, congrats! Glad that you have these speakers! I agree with you about the build quality of Decware speakers. Bob and Steve both are getting better and better. I think both are really firing on all cylinders now across the board. I too know that my speakers are not ever going to be the weakest link. And with the Torii powering them, it's not going to be amplification that gives up early either. I remember when I first received mine and played music I was familiar with I immediately noticed the bottom end that my previous bookshelf speakers just could not produce. Then as they broke in I noticed the sweetness, detail and impact improved with time. One reason you don't see many comments about these is that they are simply wonderful; so everybody who has them is satisfied with them. So there is really a lot that could be reported, or no need to report anything. Deal of the century! Dollar/performance is unmatched. There are speakers that do some things much better but not any speakers at this price that do almost everything they do just right. Buy some, try some! You won't be disappointed.